I don't know where to place the cause for the events of today. It was unexpected, a first in my life and yet for every second of it I had the sweet mesmorizing thought of victory in my head. For the not inconsiderable period from 73 kilometres (lunch) until 128 kilometres, I was leading the race for stage 32 of the Tour D'Afrique. Yesterday I was with the lead group, one of the late starters (which meant my day's time would have been less than anyone in that group who had started before me) and trying my hardest to stay with them. This is something that would have unfathomable at the beginning of the tour but which was made achievable by nearly 6 weeks of cycling. Early on in the day we had a crash. We were riding in a group and it was my turn to pull (so I was at the front). As we entered one of the first of a number of villages, we widened our group, slowed down a bit and prepared to dodge pedestrian, vehicular and animal traffic. It was a group of unruly youths whose alpha male swagger led them to touch shoulder with Dan that caused three quarters of the peloton (i.e. the three people after me) to go down. Besides Dan, Stuart and Marcel went over their handlebars into each other. I managed to glance back quickly enough to see them just as they all collided with each other. The group of youths scattered, presumably suspecting they'd caused an accident and not wanting to get in trouble. The aftermath of the accident was mainly centered on Marcel - his rear derailleur had bent into an unnatural angle and his wrist was damaged. After an x-ray today, it seems he won't be riding for a few days because it is strained - luckily not broken. Now, I hate to sound so conceited (?) but this meant that the next few stages were open. Marcel is a fantanstic cyclist, both on road and off-road. I don't think I might be able to beat him, at least not for the foreseeable future. Having ridden the last two days hard, most riders (and therefore racers) were slower today. In addition, stage 32 was the longest stage of our five day week, at 133km. From the morning, it was obvious in my mind that today would be a day to push the boat out a little and try for a good ranking. In the morning I tried riding by myself but was soon caught by Dan and Gisi who are usually part of the fastest group. I joined them since they were going at a reasonable pace and it seems that this pace was faster than most of the field as we were quickly overtaking other riders. It was useful riding in a group as there was a heavy headwind in the morning and drafting provided some protection (although I gather that I should have drafted less). When we arrived at lunch there were just three riders ahead of us, Rod, Juliana and Tim, all of whom who had left earlier than us. I stayed ahead of the group (now Dan, Gisi and Stuart) as we returned to the road after lunch and waited for them to overtake me as usually happened. For some reason, it didn't. The first climb was long, straight and on a narrow road which was being refurbished. I went at a pace that seemed workable to me and just kept pedalling. Soon, ten kilometres had passed and there was no sign of the trio. I had overtaken Rod and Juliana and Tim had left after us at lunch - I was at the front of the pack. I kept going at a pcae that seemed comfortable to me, pushing myself every now and then to up the speed a little bit. 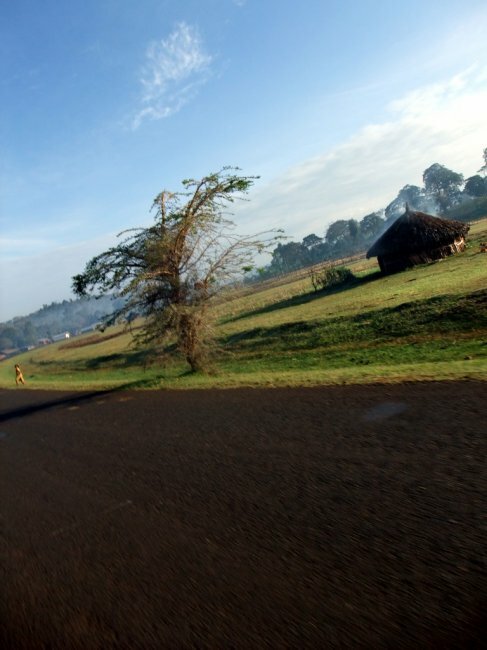 The road got worse and worse, at some points being rough and pot holed, at others being smooth but with bumpy patches of tarmac which would throw your bike all over the road. The children were as annoying as usual but I was in the zone and concentrating enough to ignore them. Every minute I would think to myself that I'd be overtaken any minute soon - that I should just prepare myself for the possibility. My brain fixated on the chance that I might just win the stage, winning something truly meaningful for the first time in my life. With each passing kilometre the chance that I'd be overtaken seemed to reduce in my mind. At 120 kilometres I ran out of energy. This happened at 100 kilometres the previous day, about 10 kilometres from the finish (I wonder if this is a mental issue) and I continued to consume an energy bar in chunks. At 128 kilometres I was finishing this off and from the corner of my vision came Stuart on his bright yellow (or 'golden') bicycle. The probably of winning the stage shrunk considerably in my head and I put everything I had left (not much at all at this point) into trying to catch him. He had gained about 250 metres in the overtake (I was going slowly as I ate) and we raced through a village and down the road. I lost sight of him as a considerable 'valley' approached (a downhill followed by an uphill).I cranked up my speed to 60 kmph on the downhill whilst realising that the orange finish flag lay at the bottom of the hill on the right. Coming in hot, I braked as hard as I could near to the flag, locking my rear wheel for several metres and then pelted down the grassy embankment, veering into the side of the water trailer at the back of the dinner truck. Touching my i-Button against the reader attached to the truck, the day was over. The time difference between us has yet to be determined. We both left in the morning at virtually the same time and so the overall result depends on how the afternoon reading was processed. My guess is that the best result (for me) would be a draw. Alternatively, Stuart will have won by a minute. I'm looking forward to finding out from Kelsey, the race secretary, tomorrow. Post race, my stomach has been acting up a bit. Not wanting to be another statistic, it has of course happened - I have become ill in Ethiopia. Luckily I think I've avoided the bug going around camp still and my problem is related to acid reflux, a problem I've had for several years and most certainly caused by the buffet breakfast at the Sheraton. I'm certain the buffet is also one of the reasons behind my racing energy over the last three days. Our convoy out of Addis Abeba was as unofficial as the convoy entering it. The only difference was this time we were riding on a Tuesday morning and not a Sunday evening - this brought the added challenge of heavy traffic. The traffic brought with it the pollution I remarked upon yesterday - a putrid layer of black smog that we had no choice but to breathe in. Our new sectional riders found it difficult to breathe with the combination of poor air and altitude. The smog didn't ease up as the convoy came to a halt (nearly 20 kilometres out of our campground) and with a brief gathering of riders, we were given the all clear to take off. The rest day (incorporatimng the Sheraton buffet) has had a positive effect on my speed and I was able to push it quite hard, keeping up with Marcel, Jerry (a new sectional rider) and a group of Ethiopian racers from Addis Abeba. This was going terrifically well until we got to a railway crossing and my bottle decided to jump out off my bike in its usual fashion. One of the Ethiopian riders waited for me, we managed a good 10-15 kilometres before I stopped to pee. Just as I was getting back onto Calamity Jane, the second fastest convoy passed by, I was unable to catch them, lacking the drafting advantage. A couple of riders dropped out though (Viv, another new sectional and Tony - both British) and I rode with them to lunch. When we arrived at the lunch bus, lunch was only just being laid out and this eroded any time advantage the group in front had. I managed to leave with the first group out of lunch and kept up with them for the relatively short 40 kilometres to camp. My heart rate was pushing a good 170/180BPM, on the extremely high side - I highly doubt this will be achievable tomorrow! Riding in a peloton was useful today since we had a strong head/cross wind and it shows in the average speed of 30.7 kmph for the day (bearing in mind that the convoy was pretty slow for the first fifth of the day). As we got closer to camp, it was clear that no one was going to overtake us and that we were the fastest group. It came to my turn to pull the group, about 5 kilometres from camp and after a short while I was puzzled to see some of the riders overtake and sprint past into the distance. Soon though, it became clear that we had reached the trucks, although for some reason they had sprinted some distance down the road (apparently looking for a Finish flag). Because of the short day, the flag hadn't reached camp yet and Stuart, Dan and I were first to the scanner on the side of the truck (this is what records our race times and determines the race winner). Conceivably I could have tagged in first and 'won' the stage but seeing as Stuart and Dan had done the majority of the pulling in the group, they tagged in first and Stuart was our new stage winner! My highest ranking yet - third. We had the whole afternoon to ourselves, we played a game of Settlers of Katan (a board game of conquest similar to Risk), I took a nap, read more of 'The Life of Pi' and photographed the large number of storks nearby. At dinner, I contemplating trying some of the meat. Today it was less processed that normal (chicken wings versus some sort of curried meat) and I couldn't bring myself to eat something that looks so close to an actual animal part. I remain vegetarian.